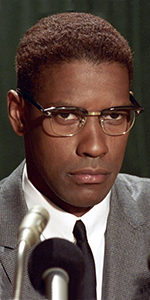 Denzel Washington as Malcolm X, released in November, 1992. Denzel Washington Jr. was born in Mount Vernon, New York, just outside The Bronx. His beautician mother and preacher / water department working father divorced when Denzel was 14. His mother Lynne sent her son to Oakland Military Academy in New Windsor, New York — which turned the young man's life around. It also helps to explain why Washington has so many films with a military setting on his resumé. Denzel attended high school in Daytona Beach, Florida. Playing basketball while attending Fordham University, he took a summer off and was a camp councilor at the YMCA Camp Sloane in Lakeville, Connecticut. After appearing in a talent show there, a fellow staffer suggested that Denzel become an actor. He graduated from Fordham in 1977 with a BA in Drama and Journalism. He attended the American Conservatory Theatre's graduate school in San Fransico, then headed to New York to make it big. Right away, Denzel played Robert Eldrdige, husband to the title character Wilma with Shirley Jo Finney as Olympic sprinter Wilma Rudolph, which aired over NBC in December, 1977. In his first feature, he played George Segal's long-lost son in director Michael Schultz's Carbon Copy (released in September, 1981). Washington then appeared in the Pulitzer Prize-winning ensemble play A Soldier's Play (along with Adolph Ceasar and Samuel L. Jackson). The show ran off-Broadway for 468 performances, from November, 1981 to January, 1983, but Washington had to leave the show for Los Angeles, when he was cast as Dr. Philip Chandler for 137 episodes of St. Elsewhere aired over NBC from October, 1982 to May, 1988. In the meantime, Washington did a tiny role as an attorney in License to Kill aired over CBS in January, 1984, with James Farentino. He was asked to appear in director Norman Jewison's film adaptation of A Soldier's Story (released in November, 1984) with Howard E. Rollins Jr., then worked for Richard Attenborough as South African activist Steven Biko in Cry Freedom (released in November, 1987) with Kevin Kline. Denzel Washington headlined for the first time in For Queen & Country (released in May, 1989), and The Mighty Quinn (released in February, 1989) with Robert Townsend. But it was in his supporting role as a tough, reluctant member of the 54th Massachusetts Infantry Regiment in Ed Zwick's feature directoral debut, Glory (released in December, 1989) with Matthew Broderick, that brought him to household name territory. The powerful film won Washington a Supporting Actor Oscar. Now, directors wanted what Washington brought to a film. He, like many before him, chose to work in both genre films, and more individual films. He worked for the the first time for director Spike Lee in Mo' Better Blues (released in August, 1990) with Wesley Snipes, worked for Indian director Mira Nair in Mississippi Masala (released in February, 1992) with Sarita Choudhury, then played a prosecuting attorney harrased by a felon he put away in Ricochet (which played the Chinese in October, 1991) with John Lithgow. Director Norman Jewison wanted to film Washington as the activist Malcolm X, but Spike Lee got to direct it as a three-hours-plus epic. Malcolm X (which played the Chinese in November, 1992) with Angela Bassett, features Washington in the part he was born to play. A truly great picture. Washington again played a lawyer in Philadelphia (released in December, 1993) with Tom Hanks, played a reporter (journalism major, remember) in The Pelican Brief (which played the Chinese in December, 1993) with Julia Roberts. Working for director Tony Scott, Denzel played a young naval officer running a mutiny on a submarine in Crimson Tide (released in May, 1995) with Gene Hackman. He played 1940s detective Easy Rawlins in Devil in a Blue Dress (released in September, 1995) with Tom Sizemore, teamed up with director Ed Zwick once more in Courage Under Fire (released in July, 1996) with Meg Ryan, and played an angel in the remake of The Preacher's Wife (released in December, 1996) with Whitney Houston. Denzel played a homicide detective inFallen (released in January, 1988) with John Goodman, and finally got to play some basketball in Spike Lee's He Got Game (released in May, 1998) with Mila Jovovich. Showing there was no hard feelings over Malcolm X, Norman Jewison directed Denzel as Rubin "Hurricane" Carter in The Hurricane (released in January, 2000) with Vicellous Shannon. Denzel played a football coach in Remember the Titans (released in September, 2000) with Will Patton, and a morally bankrupt drug officer in Training Day (which played the Chinese in October, 2001) with Ethan Hawke, which won Denzel an Oscar for Best Actor. Washington directed and starred as a psychologist to Antwone Fisher (released in January, 2003) with Derek Luke in the title role, and starred as a man at the end of his rope in John Q (released in February, 2003) with Robert Duvall. Tony Scott's masterpiece, Man on Fire (released in April, 2004) with Dakota Fanning, is one of Denzel's best. He took on the Frank Sinatra role in the remake of The Manchurian Candidate (which played the Chinese in July, 2004) with Meryl Streep, made a bank robbery picture for Spike Lee, Inside Man (which played the Chinese in March, 2006) with Clive Owen. Washington finally worked with the other Scott, Ridley Scott in American Gangster (released in November, 2007) with Russell Crowe, which bacame his highest-grossing film internationally. Denzel directed and starred in The Great Debaters (released in December, 2007) with Forest Whitaker, took on the Walter Matthau role for Tony Scott in the remake of The Taking of Pelham 123 (released in June, 2009) with John Travolta, and came close to playing Mad Max in The Book of Eli (which played the Chinese in January, 2010). The strangely reworked version of The Defiant Ones worked well for Washington, as Safe House (released in February, 2012) with Ryan Reynolds, became his second top-grossing film. He worked for director Robert Zemeckis in Flight (released in November, 2012) with Nadine Velezquez. He played a mysterious assassin / savior in The Equalizer (which played the Chinese in September, 2014) with Marton Csokas, then headlined in Antoine Fuqua's remake of The Magnificent Seven (which played the Chinese in September, 2016). Washington directed and starred in Fences (released in December, 2016) with Viola Davis, starred as Roman J. Isreal, Esq. (released in November, 2017) with Colin Farrell, and headlined The Equalizer 2 (which played the Chinese in July, 2018). Mann's Chinese Theatre, Hollywood, California. Denzel Washington Forecourt ceremony, Thursday, January 15, 1998. 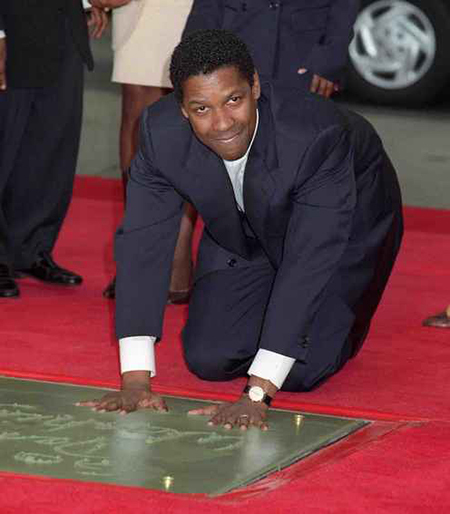 Denzel Washington flashes a smile while placing his hands into the cement.